I actually got quite a bit of sewing done this last week. 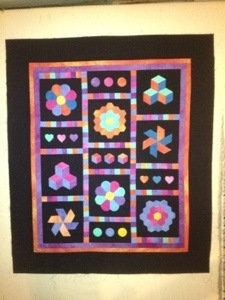 First off, I completed my EPP quilt too. I really like it in the bright colors. My flying geese have taken over the wall now. 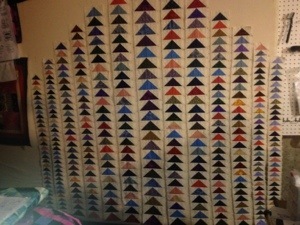 I have all the rows sewn, now just need to get them sewn together with sashing strips. After making 288 Flying Geese for the quilt I am working on, your Flying Geese are impressive! I love the variation in size. It will be beautiful when you are finished. You flying geese are wonderful! Can’t wait to see the quilt put together.